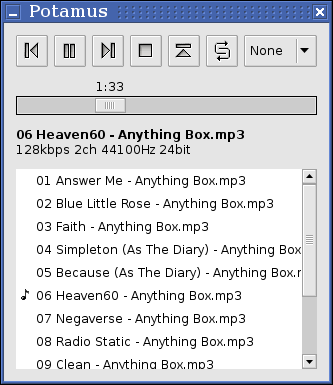 Potamus is a lightweight GTK-based audio player with a simple interface and an emphasis on high audio quality. It was written as a reaction to players like Rhythmbox that use a complex database to keep track of a music collection. My preference instead is to make use of the filesystem for sorting music, so Potamus knows nothing about the files it's playing other than their names, and tries to make it as easy as possible to use your file manager to locate and play music. Potamus is a successor to GNU xhippo, which was in turn inspired by HippoPlayer. It can decode FLAC, Ogg Vorbis, Opus, MPEG audio, and any format supported by the ModPlug, audiofile or FFmpeg libraries (including WAV, Shorten, and various module formats). For MPEG audio playback (including MP3), it uses libmad's high-quality decoder to produce dithered 24-bit output. It can use OSS or ALSA (via libao) for direct output, or can work with JACK, converting sample rates and formats where necessary. It supports 24-bit audio output and gapless playback. The buttons are: previous song, play/pause, next song, stop, clear playlist, shuffle playlist. You can drag files around in the playlist to reorder them. Files and directories can be added to the playlist by drag-and-drop, or by giving potamus command-line parameters on startup. I have set potamus to be an action on directories in my file manager, so I can browse my albums directory, right-click an album and start it playing in Potamus. OOPS ( out-of-phase stereo ) gives you the difference between the channels, which effectively removes anything panned to the centre of the stereo image, and can reveal compression artefacts. Phase phase-inverts the right channel, to fix an out-of-phase recording. Left and Right feed the selected channel to both outputs. Swap feeds the left channel to the right output, and vice versa. cdsuite is the CD ripper that I use with Potamus.